This wonderful competition is recorded for posterity in a DVD of 5 HOURS, presenting the complete Prejudging and Finals of the Arnold Classic Pro Men, Pro 212, Pro Men’s Physique & Pro Wheelchair as well as the final event and awards for the Arnold Strongman Classic. 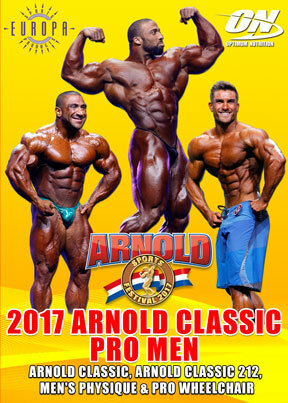 Arnold Classic, Arnold Classic 212, Men’s Physique & Pro Wheelchair. The Strongman Winner was Brian Shaw who took out his 3rd Arnold Classic Strongman title. This event was a multiple camera shoot using the latest HD cameras. Also available on Blu-ray, GMV-972BRDVD, as well as on regular DVD.